Today in America, 10 million men and women have been diagnosed with osteoporosis, 18 million are at risk for developing it, and another 34 million are at risk for low bone mass, or osteopenia, a precursor to osteoporosis. That’s 62 million Americans in all! Think of what a fortune pharmaceutical companies are making from osteoporosis drugs! While women are more susceptible than men, more men have osteoporosis than we realize. So what can you do if you’re at risk for or concerned about developing osteoporosis? Well, you already know the advice that most people will give you, right? Drink more milk! Listen folks, if you learn one thing from me today, I hope it’s this: milk does not make your bones stronger. This is a myth thanks to the dairy lobby that has really caught on. Dairy is filled with mucous and sugar so it clogs and acidifies your digestive system and your body. After 12 years of study, Harvard researchers noted a correlation between dairy consumption and increased hip fractures in women. Men who have 2+ servings of dairy a day have a 60% increased risk of prostate cancer. Casein, one of the most carcinogenic compounds in food, is found in cow’s milk, and it is the #1 allergy in children! I know this may be a shock to many reading this. It was a shock to me as well when I first read the research. Growing up we had to drink milk EVERY night at dinner, our parents were doing what they THOUGHT was the right thing… they didn’t know either. But the fact is a fact… This is what the research shows and it’s not my opinion either. Milk is acidic, period… and it leaches calcium from your bones! Milk is the #1 allergy in children, and as parents, should be something we should all reconsider. Here in the US, we consume the largest amount of dairy in the world, yet we have the highest rate of osteoporosis. Can you see the problem here? Dairy isn’t the solution. It’s part of the problem. It’s been estimated that the Standard American Diet (or SAD diet as I call it) robs our skeletons of almost half its calcium over a period of 20 years! Living a clean, nutrient-dense diet rich in alkaline minerals like calcium, magnesium, and potassium is what keeps our bones strong. And there are plenty of great foods to deliver all of those minerals and more without eating any dairy. We’ll get to those in a minute. First, let’s talk about how osteoporosis develops and how you can prevent it. As you know if you’ve followed me for any length of time, the pH of your blood ALWAYS tightly regulates itself at 7.365. It’s just as crucial as your body temperature. In fact, this number is so important that if it deviates by even as much as a point on the scale of 0-14, you are dead. It really is a fantastic question and where so many people go wrong. Here’s the answer and it’s also the key to osteoporosis: If you’re not getting enough minerals from the foods you eat and drink to neutralize the acid in your body, it will find any alkaline mineral store that’s available. It will grab some minerals from your mouth, which can lead to tooth decay. Unfortunately, your mouth doesn’t have a big supply, so it moves on to other sources. Next, it goes after magnesium from your muscles, which can lead to muscle pain and cramps. Finally, your body turns to its greatest mineral bank, calcium from your bones. You can guess what that leads to… not just osteoporosis but also joint pain and osteoarthritis. Osteoporosis is an ACID PROBLEM! The pH of your blood is that important that it will let your body fall apart before it allows its pH to veer off course. So the purpose of eating alkaline foods, drinking alkaline water, and avoiding acidic foods is NOT to try and raise the pH of your blood. It’s to prevent your body from having to do the regulating on its own by depleting its own resources when food is not sufficient. Since the biggest source of much-needed minerals is your bones, if you’re at risk for osteoporosis, it’s vitally important you GET OFF YOUR ACID. 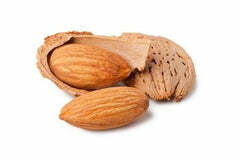 Here are the top 10 low acid foods to ensure you’re getting plenty of calcium. In addition to eating foods high in calcium, it’s vital to make sure you’re getting plenty of magnesium, potassium, and sodium bicarbonate so your body can efficiently put calcium to good use keeping your bones strong. 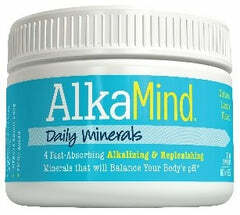 AlkaMind Daily Minerals takes care of all of that for you each and every day so that your body doesn’t have to go on a mineral hunt and pull all of that good stuff out of your bones. Drink 30 minutes before going to sleep; and within 15 minutes after exercise to neutralize the lactic acid that makes you retain water and fat. Find out more about Daily Minerals now.